Proceratosaurus is a genus of small(2,5 -3 metre long) proceratosaurid theropod. 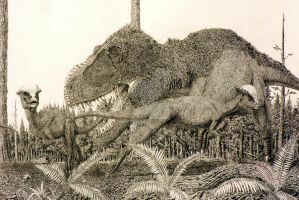 The proceratosaurids include 4 different genera,which are all small sized except the huge sinotyrannus which was 10 metres long. 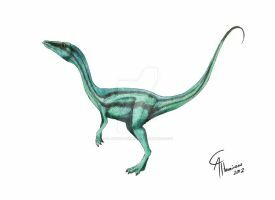 The other genera are guanlong which is the most popular proceratosaurid, Kileskus and Proceratosaurus itself. Proceratosaurus lived in england, supporting the theory that Tyrannosaurs evolved in europe. The only known fossil of proceratosaurus is a single incomplete skull . The nasal crest in other proceratosaurs is missing and only a small "horn " sat on the snout. Because of that it was thought to be an ancestor of ceratosaurus,but in later studies it was shown to be a coelurosaur that has its own family. Being a proceratosaurid means that this was an ancestor of the Tyrannosaurs and the proceratosauridae are included in the Tyrannosauroidea. Today many conside the horn just to be the fossilized remains of an once big crest similar to guanlongs crest. The holotype specimen can be seen in London. Now, draw a Genyodectes, I challenge you! Awesome! I love this guy!